Exclusive UKCampsite.co.uk Discount Where to Buy Win this Bike Rack! This is one of the Roofbox Companys five "Hall of Fame" all time outstanding products, representing as it does a quantum leap in bike carrier design. The bike platform slides away from the tow ball to allow good access to the tailgate, taking the weight of the bikes. 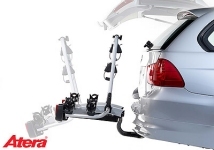 It has an innovative self-adjusting tow ball fixing system which also holds the carrier horizontal as soon as it's placed on the tow ball, a triangular frame shape that allows you to come right in close to the tow ball (so you don't have to lean across the bike carrier to access the boot space, with consequent risk to your back), and even UK legal foglights. And it's small enough to put into the boot when not in use. And also very light. 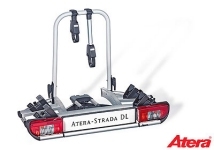 The Roofbox Company reckon that the Atera STRADA DL tilting bike carriers are the best designed and best engineered tow ball carriers on the market, bar none. 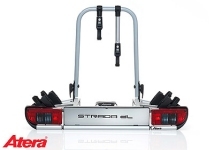 What's so special about the STRADA DL 2? Fundamentally, it slides away from the vehicle, rather than tilting, i.e. the bike carrier takes the weight of the bikes, rather than you, and there's tailgate clearance even for vehicles with vertical tailgates. It's by far and away the easiest tilting carrier to use. It fits to 'bolt on' or 'swan neck' tow balls Just place it on the tow ball and push down the handle - no spanners or Allen keys are required. It's very easy to carry - it won't bump your shins if carried properly - and as soon as you place it on the tow ball the weight is taken, so you can straighten up and rest your back. Other carriers require you to support the platform with one hand while fiddling with the fixing system with the other. It's much the lightest of the 2 or 3 bike tilting wheel support racks on the market. The bike frame holders are the best available, incorporating a ratchet tightening mechanism. They fit oval and other outsize frames as well as round ones, wrapping a strap right around the frame for safety and security. The frame is triangular which allows you, when the bikes have been slid out of the way, to stand almost right up against the tow ball. This means you can lift items into and out of the boot both safely and easily. It makes sense when using this carrier to place a safety strap around all the bikes and the bike holder support frame. The Roofbox Company therefore provide a free strap with each carrier! 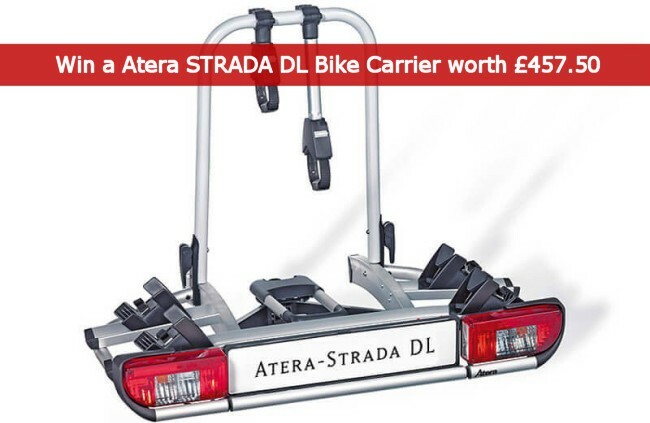 The Atera STRADA DL 2 Tilting Bike Carrier has an RRP of just £457.50, however is currently on offer from The Roof Box Company at £349.95. The Roof Box Company is the UK's leading mail order supplier of car roof boxes, roof bars, Thule roof racks, bike racks and more. 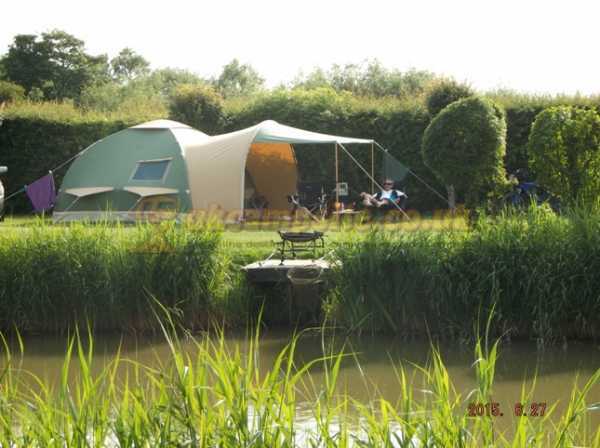 Their prices are already massively discounted but, for UKCampsite.co.uk members, they are offering a further 5% off EVERYTHING on their website, excluding Package Deals, Bargain items and Carriage costs. Click here to visit their site and claim your discount. They are, undoubtedly, great at what they do .... though pricey ... the only drawback, for some, will be that you cannot tow and carry bikes at the same time. Roof Box also rave about, and sell, the MaxxRaxx bike carrier, which allows towing ... and is a lot cheaper. ... but for those not towing, this type of carrier are the bee's knee's! Can't comment on this particular make/model, as I have a Thule equivalent (although I have had excellent dealings with The RoofboxCo). I can tilt mine (with 2 bikes still in place, of course), and get all my gear... including a big/bulky/heavy tent... in and out of my boot via the tailgate (Was Kia Sedona, now VW Sharan... both MPV's). My previous non-tilting carrier had to be removed from the towbar (after first removing each bike, of course!) to get at the tailgate... and then secured to a tree or similar, for the duration of any camping trip! With a tilter, there's no need to remove, and as the carrier is locked to the towball, and the bikes locked to the carrier, all remains secure, on or off site. I'd highly recommend at least "this type" of cycle carrier to anyone who takes bikes (but doesn't tow!). A fabulous bit of kit. I don't need one... but there's no harm in entering the competition!! Great stuff... and a big thanks to both UKCS and Roofboxco! AutoSock car snow socks from The Roof Box Company give normal road tyres the grip they need on ice and snow to get you home. Don't get caught by the awful winter weather again. Claim an exclusive discount, and enter our competition to win some! The Husky L roofbox includes all the essential attributes of any KAMEI box - really good looks, ease of use, top quality mouldings, excellent security, wide opening on gas struts plus so much more. Available from the Roof Box Company. Win one here! The excellent BUZZ RACK Buzzwing folds to make storage really convenient and comes at a great price for such a robust carrier with so many useful features. The Buffalo is an exceptionally well designed and smart carrier for 4 bikes which fits all tow balls, tilts via a foot operated pedal, includes an integrated cable lock and has well padded bike cradles. The towbar mounted BUZZ RACK Scorpion is a great choice for anyone who wants to carry 2 bikes, especially heavy bikes or electric bikes. Find out more, use our exclusive discount voucher, and get a chance to win one! According to Roofbox.co.uk, this is possibly the best 4 bike wheel support rack on the market for less than £300. It's mounted on the towball, and folds flat for easy storage. Find out more and enter out competition to win one! The RUD i-Sock is a completely new safety product that offers exceptional grip on snowy and icy surfaces, just strap them onto your boots or shoes. See videos of them in action, get an exclusive discount and a chance to win some! One of the best top quality roof boxes on the market, with the longest guarantee of any manufacturer in the car rack systems sector. There comes a time when you have already upgraded to a bigger car (twice), and you still cannot fit all your camping gear in, including the kids and dogs for a weekend away, so what do you do?